Customers live in a world of instantaneous expectation, where everything moves at breakneck speed. With digital sales, consumer feedback and devices producing data at an equally rapid pace and at larger and larger volumes, putting this massive amount of information to use in real time is the difference between capitalizing on the advantages of a 360-degree view of a target audience, and losing customers to competitors that do. This information, that has become too large and complex for traditional data processing and data management applications, is known as big data. More broadly, big data is a term used to describe the gathering, analysis and utilization of massive amounts of digital information to improve business operations. By analyzing countless interactions, patterns and inconsistencies taking place within an industry, big data drives new innovations, inventive products and enhanced tools to market. By monitoring and predicting activity and challenges, an organization’s products and services, new and old, can easily be identified as profitable, unprofitable, or somewhere in between. The insights gained from big data operations can quickly identify areas of underutilization, as well as areas that need more care. This information allows decision-makers to keep budgets adaptable so they can operate in evolving environments. Data is expected to grow ten-fold worldwide within the near future. If the opportunities offered by this data are embraced properly, they can provide an unlimited number of benefits. If ignored, they can lead to loss of market share to more innovative competition and eventually, to business closure. The ability to analyze, interpret and make informed business decisions from big data is vital to the success of any organization. In markets of rising competitiveness, it’s imperative for these organizations to secure the ability to make quick and increasingly complex decisions to satisfy changing customer demands in changing market conditions. By wrangling your data and harnessing its power, you can create more efficient operations, identify new revenue opportunities within your existing business operations, improve your customer service and increase your bottom-line performance. By becoming data-driven, you gain a significant competitive edge over your competition. While organizations are continually challenged with how to properly utilize big data and all of its benefits, companies in nearly every industry are currently using big data to break new ground, facilitate growth opportunities and to bring the ability to analyze and gain insight at a rate that’s never been available. According to a recent study by IDC, worldwide data creation will grow to 163 zettabytes by 2025, which is ten times the amount of data produced in 2017. Typical computing systems struggle to process today’s volume, much less the increasing volume that looms on the horizon. Big data’s tools and technologies continue to provide solutions for managing this constant flood of information, along with the ability to make better, more informed, data-driven business decisions faster. Because of this, according to IDC, organizations will spend $260 billion on big data and analytics technology by 2022. With big data’s help, you can learn new ways to gain actionable insight from your own information that will help you better understand your customers and outperform your competitors. Additionally, you may also experience a boost to your bottom line performance due to improvements in your efficiencies and business processes. Here are just a few ways big data is impacting day-to-day business, along with some real-world examples. The analysis of big data delivers the ability to develop highly accurate targeted marketing campaigns, which allows organizations to finely target their marketing efforts to specifically identified customer needs. In fact, effective analysis of big data can actually help predict what products or services customers may need in the future, which makes organizations more proactive with customized marketing messages to customers for very particular items or needs. In 2012, a Target statistician used target marketing techniques to correctly identify women who were pregnant based on a pattern of purchases of about 25 items. He was also able to estimate due dates within a very small window, so Target could send coupons timed to very specific stages of pregnancy. Big data provides the capabilities to predict what customers are looking for in new products or services. This delivers data-driven proof and reasoning for product development and increases the likelihood of the new product or service’s success, while lessening the chance of capital failure. Instead of waiting for customers tell you what they’re looking for and losing market-share to more innovative competitors that went to market faster, you can drive innovation from your data and fulfill your customer’s needs like never before. Netflix today is using data not only to make your viewing better with its recommendations engine, but also to improve the quality of content itself by funding new productions based on what they see viewers asking for, which is also improving their own profitability. With big data’s help, you can know exactly what your customers are going to need before they click send or pick up the phone. Real-time analysis of a customer’s information, along with history of website visits, social media posts, and previous calls and chats, can help predict a few issues that the customer could be dealing with. This provides your customer service team with a head start and will allow them to deliver knowledgeable and timely solutions to the customer. Furthermore, predictive analysis techniques can provide your customer support staff with the ability to proactively contact customers where it’s been determined that a future issue could arise. The Royal Bank of Scotland uses patterns to predict what products a customer may want and what issues may occur. Real-time data analytics help them track complaints so they can understand the big issues and predict what questions or complaints their customers may have while delivering the right resources to ensure that customers are quickly taken care of. Big data supplies heavy data about every product and process within your organization. By gaining a full understanding of each, your decision-makers can identify shortfalls and look for ways to optimize and change to ensure maximum operational efficiency. After all, ensuring maximum operational efficiency ensures a solid bottom line performance. Operational and historical data from a variety of sources such as machine logs, social media, web, apps, or other equipment can be correlated and reported for very clear and actionable insights into opportunities for improvement. PepsiCo relies on huge volumes of data for efficient supply chain management. Their clients provide reports that include their warehouse inventory and the point of sale (POS) inventory to the company. This data is used to reconcile and forecast production and shipment needs. This way, PepsiCo ensures retailers have the right products, in the right volumes and at the right time. Big data helps in providing business intelligence that can reduce enterprise costs and optimize expenses. Big data’s insights can be used to transform business processes, based on the impact of different variables, which helps to cut costs and increase profits. This also helps to eliminate unwanted costs and boost productivity. Steadily, big data is showing itself to be an efficient operational cost-cutting tool that’s helping many organizations save substantial money. Since 2012, Intel has used big data and predictive analytics as a means of bringing chips to market faster. They’re using gathered information to streamline testing. Whereas each chip formerly underwent 19,000 separate tests, Intel now focuses those tests on specific chips and has saved a total of $3 million in manufacturing costs on a single line of Intel Core processors. The volume of intelligence available in big data reduces the time it takes to identify and resolve a threat. This allows IT teams to predict a forthcoming attack and minimize damage, or prevent it from ever occurring. Recent research has shown that approximately 84% of modern businesses leverage big data to block countless cyberattacks. The introduction of big data in operations can result in a significant decline in security breaches. By utilizing big data tools, malicious insider programs, weak and compromised devices, ransomware and malware attacks and more, can all be easily detected. QSight IT, an IT company based in the Netherlands, leverages big data to gain insights into determining the potential impact of security related events. Through a big data platform, QSight gained the ability to mitigate risks and monitor them at a more granular level, giving them a clearer picture of security threats, while allowing them to process their data more quickly. More devices and objects are now linked to the internet than ever before, with more connecting every day. These devices transmit the data they gather for analysis to identify trends and patterns that can be utilized to make a positive impact on a variety of worldly areas, such as energy management, health and transportation, along with impacting the business world. While the data itself doesn’t create objectives, the solutions that emerge from examining it help determine the next, or best, course of action. In a nutshell, this is the relationship between the Internet of Things (IoT) and big data. And while they are closely entangled, they are not the same thing. IoT devices can be just about anything. Cars, refrigerators, watches, phones, railway tracks, smart home devices and many, many more, all either already have or could have computer chips or sensors included for the purposes of gathering data. The notion of IoT is to take these things, connect them to the internet (those that aren’t already) and collect the data they provide, mostly for specifics on product performance and customer usage patterns. As IoT continues expanding, it is projected that by 2020, 20.8 billion things will be utilized around the globe. All of these devices will gather, analyze, share and transmit data in real time. With all those devices pushing all that data, that critically significant insight would be lost without an effective way to control it. Thankfully, IoT has big data. Big data tools and technologies have the capacity to handle the large volumes of data generated from the IoT devices that are creating a continuous stream of information. IoT provides information from which big data tools can extract to generate insight. Effective big data solutions oblige the processing of rapid ingestion followed by fast and accurate mining for real-time analytics. Big data’s role with IoT is essentially to process those large amounts of data in real time and then store it, utilizing different storage technologies. A large amount of data is generated by IoT devices which are collected in the given big data system. The large amount of data is stored in big data files within the big data system. Analysis is performed on the stored IoT big data using an analytics tool. Reports of the analyzed data are generated and provide rapid insights that can be used to make quicker, more informed business decisions. The more IoT expands and grows, the more demand businesses will have for big data capabilities. While each independently provides their own sets of benefits, together, they can have a deeper, more meaningful impact. As a result of IoT big data analysis, an improved understanding of the information is achieved, which helps an organization make efficient and well-informed decisions, along with other far-reaching benefits. The merging of IoT and big data provides new opportunities and applications in all areas of business, along with offering the potential to revolutionize many aspects of the day-to-day. A survey of c-suite executives performed by NewVantage Partners about Big Data and AI found that 97% of executives stated their companies are investing in, building, or launching big data and artificial intelligence (AI) initiatives. Furthermore, 76% of those executives feel AI and big data are becoming closely interconnected and that the greater availability of data is empowering AI and cognitive initiatives within their organizations. The volume and variety of data that is already flowing into big data ecosystems is nearly impossible to manage. As that volume continues to grow through the use of an increasing number of computers, smartphones, tablets and IoT devices, the data will become insurmountable. The task of sorting through all of that data, parsing it and analyzing all of it for purposes of improving business decision-making processes, is simply too much for humans to efficiently handle. But with the help of artificially intelligent tools, it is possible to gain intelligent insight from of all of that disorder. By using both unstructured and structured data from various organizational sources and silos, as well as public domain data sources, AI and machine learning can help make sense of big data’s information and streamline the process of providing insightful, business-critical data in real time. Structured data refers to any data that resides in a fixed field within a record or file, whose pattern makes them easily searchable and accessible. Examples of this information could include phone numbers, zip codes, names, dates, billing info and currency. Unstructured data refers to all of those things that can’t be so readily classified. Videos, emails, audio, images, podcasts and social media postings are just a few examples. Additionally, AI can build knowledge from that data that, when applied, can accurately predict customer trends and traits based on purchase history, time spent in particular parts of a site or a store, product or service comparisons and a multitude of other bits of information. Big data is the input. It needs to be sorted through, properly structured and integrated before it can become useful insight. AI is the output. It’s the intelligence that results from all of that data that’s been managed. While the two are fundamentally different, they also have differences in how they are used. Big data is mostly about gaining insight. It doesn’t act on what it uncovers, it simply looks for it. AI is about decision making, and learning to make better decisions. It’s about performing tasks previously done by humans, but more quickly and with minimal errors. But while different, AI and big data also go hand in hand. Big data and AI have become synergistic because of AI’s ability to work with data analytics. Big data is helping AI machine learning become smarter by feeding the AI engine its everyday data input. Big data is essentially the lifeblood of AI. And because big data isn’t fading away anytime soon, AI will be in high demand for years to come. AI provides the ability to make connections between oftentimes siloed data sets gathered in big data ecosystems. This enables a holistic view of complex data problems, from which new AI-driven insights can be identified and applied to increase the chances of business success. AI is still in its infancy with regards to mainstream usage and applications, but the more data it consumes, the faster it will mature and become common in everyday life. Fields of AI, such as natural language processing, automated learning and scheduling and robotics and machine learning, will also become more mature as AI strengthens its bond with big data. Big data will continue to grow as AI continues its ascent and more tasks become candidates for automation, while AI will become a larger field as more data is available for learning and analysis. Our eyes are drawn to visual stimuli such as patterns and colors. In fact, our brains process visual data 60,000 times faster than text, while an astounding 90 percent of the information transmitted to our brains is visual. To go one step further, according to a study by org, this effect increases over time. After three days, the study showed that a user retained only 10-20 percent of written or spoken information, but almost 65 percent of visual information. There’s no denying that our culture is visual, in every aspect of life. Visual elements provide a straightforward way to grab a person’s interest, make complex information understandable, or to keep eyes on a specific message. Data visualization is essentially the presentation of data in pictorial or graphical format with an endless range of data art creativity. In the world of big data, data visualization tools and technologies are crucially important to examine substantial amounts of information and make proper, data-driven decisions. They enable c-suite executives to easily understand complex big data information or identify patterns and provide the backbone for more successful innovation and growth. The idea of using pictures to more easily understand data has been around for centuries. Raw forms, such as the Quipu talking knots used by the Incans, or the Egyptian Turin Papyrus Map, date back to 2600 and 1160 B.C. respectively. In the mid-17th century, however, a Flemish astronomer is believed to have provided the first visual representation of statistical data. Michael Florent Van Langren developed a one-dimensional line graph that showed the twelve known estimates of the difference in longitude between Toledo and Rome, as well as the name of the astronomer who provided the estimate. In the 18th century, William Playfair, a Scottish engineer and political activist, created the first bar chart, which represented Scotland’s imports and exports from 17 countries. In addition, he also went on to invent many of the most popular graphs we use today, such as line, circle and pie charts. The industrial revolution in the 19th century provided a boom in statistical graphics due to the creation of modern business. Official government statistical offices were developed to support a global populace and there was a growing importance placed on numerical data in social planning, industrialization, commerce, and transportation, among others. Now, with the digital revolution in full swing, data visualization has become more important than ever to help make sense of the massive amount of data generated every day. According to the World Economic Forum, there are 2.5 quintillion bytes of data produced every day across the world. Additionally, 90% of that data has been generated within the last two years alone. With that amount of data coming in every day, not only is it hard to manage, but it’s even harder to make effective observations from it. Because of the way our brains process that information, using visual elements to make these large amounts of data sets more understandable is much easier than sifting through reports or spreadsheets filled with text. It’s a quick and easy way to communicate business-critical information and ideas in a universal way. In short, the better you can express your points visually, the better you can leverage your information. By applying visual elements to the information, data visualization helps make vast amounts of data easy to understand and thus, quicker to comprehend. Organizations that are able to quickly act upon what their data is telling them will be able to rapidly meet customer demand while becoming more competitive and innovative in the market because they’ll be able to make better, more informed decisions sooner than their competition. Data visualization can also provide insight that traditional text statistics cannot. It goes beyond presenting numbers and facts; it presents insights as visual stories, which can be much more powerful and effective upon delivery. Used to show a change in one or more variables over time. Used to compare multiple variables in a single timeframe or a single variable in a time series. Used to show parts of a whole. Used to show the correlation between two variables. Used to find the frequency distribution of a given dataset. Used to analyze a variable across a matrix of data (such as timeframe). Used to compare relationships within a network. Used to visualize the flow of quantity. Used to compare parts of a whole when there are many categories. Determine what information you want to communicate and how visualization will help you do so. Understand the data you want to visualize, including its distinctiveness and scope. Use a visual that delivers the information in the best and simplest way for your audience. Know your audience and understand how they will process the information you will present. Data visualization is an effective skill that isn’t going away. Used in conjunction with big data, it builds a foundation of analysis and storytelling that can lead to better business decision-making and increased bottom line performance. There’s no question that big data can add tremendous value to nearly all areas across your organization. Data is the major asset of the digital world and every organization must alter their thinking about how that data is controlled and managed, or risk being outdone by more innovative competitors. While this is true for every organization, each will realize that value in its own unique way. Understanding your business objectives and how big data would best be utilized within your organization is an important step toward realizing that value. Determining which areas of business that are most likely to yield positive results from a big data initiative helps to ensure a successful implementation and also helps realize a return on investment (ROI) more quickly. One of the most difficult and stressful tasks of starting a big data journey is choosing the right use case for your organization. Choose correctly and you gain high-level business value in a flash and achieve organizational growth, productivity and efficiency. Choose incorrectly and you get frustration, disgruntled executives, loss of time, effort and money and ultimately, a failed attempt at big data implementation. Many big data implementations fail and for many reasons, but not identifying the right use case or the success criteria of what is expected out of that use case, is a common blunder. Goals or specific expected outcomes should be identified up front. This ensures that all executives, stakeholders and decision-makers are on the same page and are in support of the objectives. There are countless big data use cases spread across industry-generic and industry-specific applications. Security, efficiency improvements and price optimization are just a few examples of general use cases that can be applied across almost any industry. Healthcare, Education and Transportation are just a few examples of industries ripe with big data use cases. Big data isn’t just a trend that leads us into the future, or an important piece of the future; big data is the future. The methods that organizations and IT professionals employ to support their operations will continue to be molded by advancements in how we store, transfer and understand data. If you’re still deciding on the right big data path for your organization, it may be worth looking at how others, possibly in your industry, are utilizing big data today. 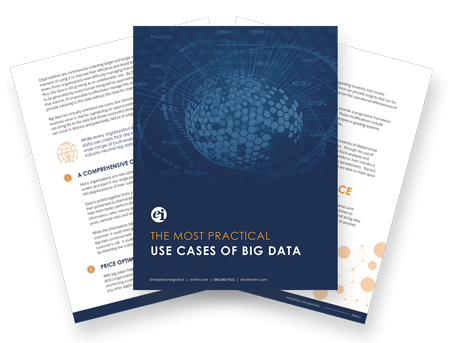 We’ve created a report compiling The Most Practical Use Cases of Big Data for just such a purpose. Click the link to receive a copy of the report and Contact Us if you have any questions. The next step is to consider what problems can occur with big data. Doing so can help you prepare for any potential challenges that may arise and also arm you with the solutions you need to overcome them. The key is to get out in front of these issues and gain a thorough understanding of their causes, so when the time comes, you’re not overwhelmed by them. When you’ve done the initial research and you’re ready to take the next step, check out our insider’s look at big data problems.